Admit it, there've been times you wanted to show your neighbors what music you like and what your speakers are capable of. You're not the only one. No matter how much I love my music and usually keep it private and only between me and my headphones, almost every morning I wish to shatter that hushed silence my house is drowning in. There're thousands of occasions when you need your music to be loud, and I'm pretty sure you've experienced the lack of loudness quite often. What can you do if the volume is at max, but you can still hear other people talking. One way - you need to make it louder. LOUDER! Using VOX Music Player for Mac & iPhone, I'll demonstrate how you should use volume booster to enhance the sound and adjust it according to your listening habits. There are a few volume boosting tools in the player, so buckle up as it's gonna be louder than bombs. VOX Music Player is a simple and powerful audio player for iPhone and Mac users. While the standard audio settings make VOX produce clear sound, I want to give you some advice on how to customize VOX audio preferences to give the sound you want. Before we start exploring VOX hidden audio secrets, I'd offer you to download the Smart﻿ Controls Extension for VOX. It allows you to use keyboard controls, Apple Remote and headphones control with VOX. EQ is an amazing tool. It helps you set the sound of your favorite songs by bringing in bits and nuances that you'd appreciate most and taking away unwelcome frequencies. It's also a great way to compensate for the low-quality sound of your loudspeakers or headphones by introducing more of what's missing and decreasing what's ample. VOX Music Player for macOS has a 10-band graphic EQ that lets you control frequency in 1/10 octave precision, and range of 12 dB in level. It's a very powerful volume booster as well as a signal processing tool that can enhance your listening experience providing you use it accurately. However, when misused, it can result in the decrease of the sound quality. Be careful when you slide the frequency up above zero as you will most likely create some perceptible distortion of the sound. The key reason for this is that modern music is initially recorded at max volume so when you use any volume booster to turn up the volume, it normally leads to the overflow of digital data and as a result – distortion. Luckily, there's a gain slider on the left. Use it to make up for the gain changes by boosting or cutting some frequencies in the EQ. Imagine you raise 100Hz at 6 dB lowering the gain to 6dB, then no distortion will occur. It will result in a volume drop, though, but you'll have a distortion-free sound, and then you can increase the volume on the device volume control. BS2B is a technology that eases listening fatigue when you listen to music through headphones. Most stereo music is recorded and produced using loudspeakers. When you listen to music through headphones, you get a wrong stereo image, which differs from what sound producer had in mind. It happens because, using loudspeakers, you hear both left and right speakers with both left and right ear. There's a sufficient level of isolation between left and right channels when you listen through headphones. BS2B mingles left and right channels to imitate the loudspeaker setup, so through headphones, it sounds just like speakers in a studio. BS2B is only available on stereo tracks, and it, of course, it makes no sense to enable it with loudspeakers. BS2B is a powerful volume booster which you shouldn't ignore. This function was designed for users who prefer multi-channel output devices (4, 5.1, 7.1). When on, it lets stereo tracks sound perfect on a multi-channel output. 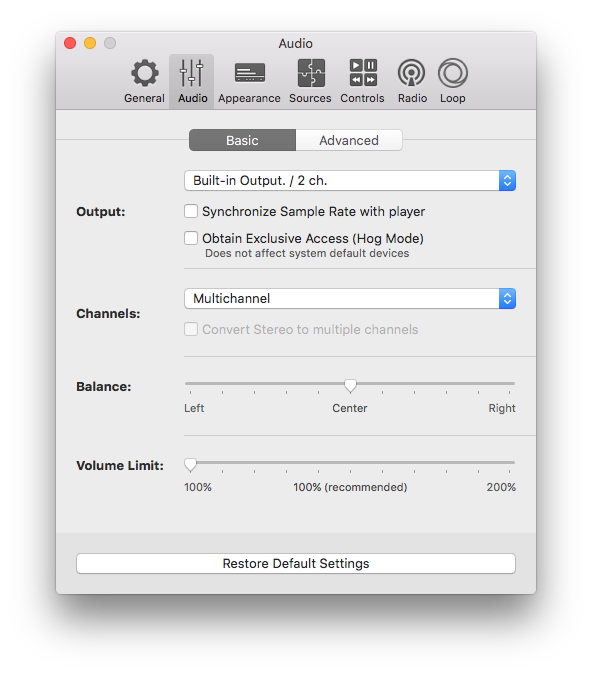 If Convert Stereo to Multiple Channels is disabled, stereo tracks will play into Left and Right channels only. VOX will blend stereo information into up to 8 channels. To control the volume, we usually use VOX Player window or Mac volume controls. However, some tracks are initially quite and what we can do is to use a volume booster, literally. Volume Limit is a feature that allows you to get even more amplification if all the stats are at max, but you still lack loudness. Go to the Audio Preferences in VOX and raise the mark above 100% and then use VOX volume control to get the desired volume level (up to 200%). Remember that it must be your last resort since it usually makes music louder at the expense of the sound quality. Make sure that before getting to volume control slider you already maximized the system and VOX volume. I recommend you to use this bar only when you want to listen to something through Mac's weak internal speakers. External speakers have own volume controls, so when possible, use those instead to get the desired level of loudness. Conclusion. Volume Booster in VOX? 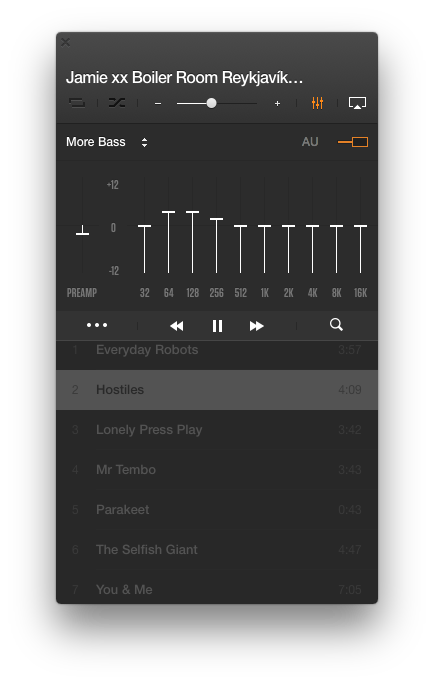 Here's a rundown of best volume boosting tools in VOX Music Player for Mac & iPhone. Use the EQ to adjust the playback for every song to achieve the best sound. Intensify the deepness of your headphones with BS2B technology. If you have a multi-channel output speaker, you can convert the stereo sound into the multiple channel audio. And if you somehow still want more, increase the volume limit. Mind that it works because the quality is reduced.